We believe that educating and helping acculturate refugees is extremely valuable. However, we believe that the most important element of our ministry is sharing the hope we have in Christ. If we fail to do this, then ultimately we have missed the most important message. 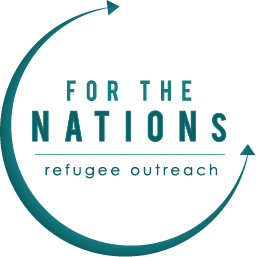 For the Nations incorporates the gospel message into everything we do. Gospel presentations and Bible lessons are a part of almost every program, event, meeting, and class, and we share this news openly and lovingly to refugees… not once, but everyday. We believe that kind, consistent repetition of the gospel in both word and deed is what God has called us to for His glory. And we trust in His promise that He will call all of His people faithfully to Himself: from every tribe, tongue, and nation. His message is not just for a few, but for the nations.